U.S. Secretary of State John Kerry, second left, meets Egyptian President Abdel Fattah El-Sisi, right, in New Delhi, India, Thursday, Sept. 1, 2016. John Kerry, the US Secretary of State, travelled to India last week and was due to leave New Delhi on Wednesday August 31. Instead, he delayed his departure, and stayed an extra 50 hours, taking “a break” and trying to coordinate joint Syria policy with Sergey Lavrov. No one in the Indian government is quite sure why US Secretary of State John Kerry decided to postpone his departure from New Delhi, even though his official engagements were long over. However, diplomatic sources told RIR that Kerry received a call from Washington that he should go on to Hangzhou in China for the G-20 summit, from the Indian capital. So he decided to stay on “privately, for a couple of days, and take a break,” sources in the media travelling with Kerry told RIR. “He actually went shopping, too” a source said. Kerry had come to the Indian capital on Sunday August 28 to co-chair the US-India Strategic and Commercial Dialogue (S&CD), along with US Commerce Secretary Penny Pritzker. The Indian chairpersons of the S&CD are External Affairs Minister Sushma Swaraj and Commerce Minister Nirmala Sitharaman. The Indo-US Strategic and Commercial Dialogue is the premier bilateral forum for discussions on trade, economic and defence-related issues. The two day discussions ended on August 30, after which the visitors met Indian Prime Minister Narendra Modi. Kerry was due to return to Washington on August 31, after delivering a talk to students at the Indian Institute of Technology in New Delhi. However, he changed his plans and chose to stay on. Indian government sources did not comment on why he extended his visit. The US Secretary of State, however, appeared to have worked hard during his “official break.” Sources confirmed to RIR that Kerry had met with Rahul Gandhi, vice-president of the Congress Party. He also visited a few religious shrines in the Indian capital. Kerry’s “break” also comprised some serious diplomacy, primarily related to Syria, coordinating with Sergey Lavrov, the Russian Foreign Minister, “for hours” on how to arrive at a joint position to resolve the crisis in Syria, sources told RIR. During his “break” the US Secretary of State also gave one interview, to India’s largest newspaper, the ‘Times of India,’ in which he spoke about working with his Russian counterpart, Foreign Minister Lavrov. He spent “over three hours on the phone with Minister Lavrov,” a diplomatic source told RIR. The two would likely be meeting in Hangzhou, China, on the sidelines of the G-20 summit, where both President Barack Obama and President Vladimir Putin are also visiting. Kerry told the Times of India, “We worked together on getting chemical weapons out of Syria. We're trying to get a cessation of hostilities in Syria." "They (Russia) were an important partner in the Iran nuclear agreement; they've been constructive in taking fuel and destroying it, limiting the stockpiles," he said of Russia. The top US diplomat also responded to a question on the Ukrainian crisis. "We have disagreements, you have to manage those. Minister Lavrov and I had a constructive day in Geneva," he said. "If we're thoughtful, clear about our concerns... hopefully we can find a way forward with Russia. It is important that we do," he said. Asked whether US sanctions could prompt Russia towards closer ties with China, Kerry said "Russia is not going to fall into anybody's arms." Kerry held a long meeting with the President of Egypt, Abdel Fattah el-Sisi, who was in New Delhi on a state visit to India, on Friday. 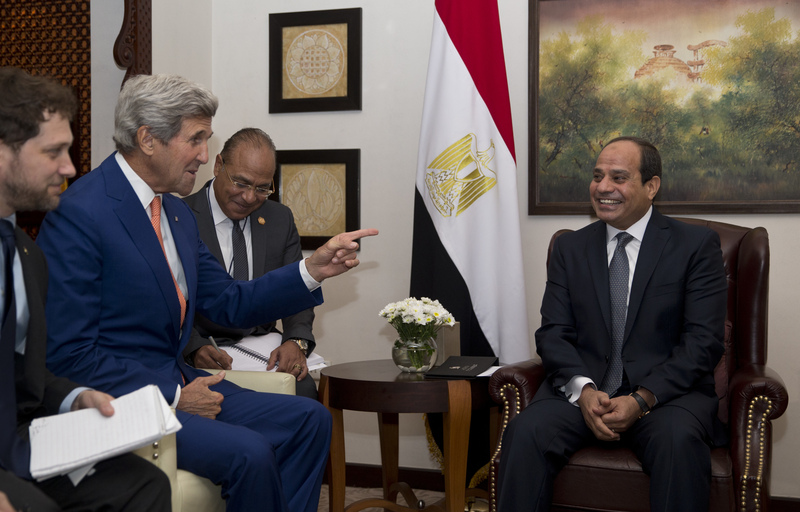 A US State Department release on Friday said, “Secretary Kerry met with Egyptian President Abdel Fattah al-Sisi tonight in New Delhi, India, where they discussed a full range of bilateral and regional issues, including Syria, Libya, and Middle East peace. On Syria, the Secretary updated President al-Sisi on our work to put in place a durable, nationwide cessation of hostilities; open full access for humanitarian assistance to all areas in need, and restart a Syrian-led process in Geneva on a political transition,” the release stated. Kerry left the Indian capital early Saturday for Hangzhou. The Egyptian President also went on to Hangzhou from New Delhi on September 3. Egypt this year is a Guest country at the summit. The Indian Prime Minister left New Delhi for Vietnam on Friday night and travelled to Hangzhou for the G-20 summit from Hanoi on Saturday night. India, like Russia, is one of the 19 member countries of the G-20. The 20th entity is the European Union. What's behind the Russia-US talks on Syria?